There A LOT of things to hate about a PCS for sure. The heartbreak of leaving the perfect neighborhood tribe of friends, the nonexistent commute, the knowledge your spouse will quickly deploy after arriving in the new city, and the specialized medical care that is just a short drive away. These are all major events that certainly are valid reasons to be griping and will significantly impact the next couple years of life at your new duty station. But what about the less significant, somewhat humorous (only when looking back on the journey!) incidents that are inevitable when a family has to pack a household of items, give them to strangers, and hope to see the same contents in a unfamiliar house in days, weeks, or months ahead? These are twenty things I hate while in the midst of a PCS. Anyone agree? Sketchy, on-the-road urgent care centers that Tricare harasses you for attempting to use. Car sickness. Dog, cat, human. It doesn’t matter; it’s always horrendous and timed for 5:30 p.m. traffic in Atlanta, Dallas, DC, or LA, without cleaning wipes of any sort in the car. Trying to protect precious items from disappearance in a move, you’ll unload a car full of jewelry, fireproof safes, and a wedding dress each time a new hotel is checked into, hoping it doesn’t get stolen from there either. Plotting an intricate route to an out of the way Chick-fil-A, but of course it’s Sunday. This isn’t obvious until the car has pulled into an empty lot. Even worse is shortly thereafter releasing the desperate bit of faith hoping all of the people in the car are simply confused, and it’s really a very quiet Saturday at the Chick. Fire alarms in the middle of the night at your hotel. How do you REALLY know if the place is on fire or if someone is just a little bored and wants to see people in pjs on the street? Summertime storms that cause power outages in your extended stay living space. Five people in what is essentially a budget hotel room zap any remaining cool air from the AC in a hurry. Extra bonus: food in the tiny fridge goes bad fast. Arriving to an under-construction hotel or temporary lodging mess, but noticing the beautiful renovations will be finished one week after you have departed. Having the worst showerhead in the entire hotel for the full two weeks of living there. No working coin operated washers and dryers in the hotel you desperately need for the aforementioned vomit clothes. Lice, chicken pox, pink eye and other disease nuisances that show up the night before departing. Hotel pool is closed for renovations. GAH!! A limb in a cast. Enough said. Not changing the shipping address in the dropdown box provided by Amazon. Bye bye, box of fancy and expensive dog food headed to California--your new house is in Virginia. Wishing you had ordered the best hometown pizza you have ever had just one more time before leaving. Getting the dreaded call from the moving company stating your delivery date is delayed by two weeks because, “It’s the busiest month of the moving season.” Duh. Looking the fool because you literally cannot tell a clerk or administrative person where you live or what your phone number is. Expiration dates. Passports, drivers’ licenses, and military IDs are timed to expire when you travel for a PCS. Spilling the last refill of a prescription down a sink drain. Sitting in a store corner somewhere trying to surf just a tiny bit of cell phone service to call and schedule the electricity to come on and finding out your landlord hasn’t turned in his authorization paperwork for you to take over the account. Happily doing yet another Target run after moving in, but suddenly becoming very confused for a moment and having no idea where you live. Targets look nearly the same everywhere. It’s a strange combo of comfort and disorientation. I know there are many, many more examples from PCSers out there. Send us a few--the funnier, the better! 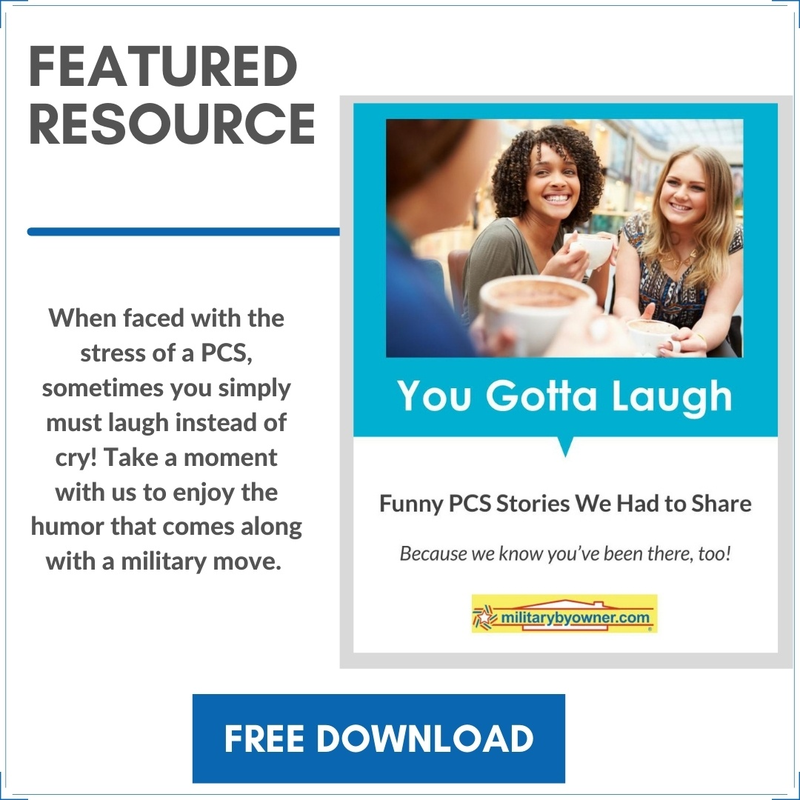 Seriously though, MilitaryByOwner really shines when it comes to its library of PCS resources. Get prepared, so these smaller “hates” about PCS will be the worst of the situation. By the way, most of these doozies were true for us, and we have lived to tell about them!